Anticipation is running high within the team. All the codes are designed. All the laser cutting and engraving is complete and passed on to Nick. So our job is done. We now nervously await and brace ourselves for the completion of the guitar. We’re not the only ones bracing ourselves, however, as Carolan’s Soundboard and back panel are currently having internal wooden struts fixed to strengthen and reinforce them against the enormous tension exerted by the strings and the neck. Without these the guitar will warp, fold and collapse into a splintered mess. The placement, shape and size of these bracing’s are paramount to how strong the guitar is, but also what it sounds like. Minor adjustments can dramatically change how the soundboard resonates and therefore the tonal quality of the guitar. 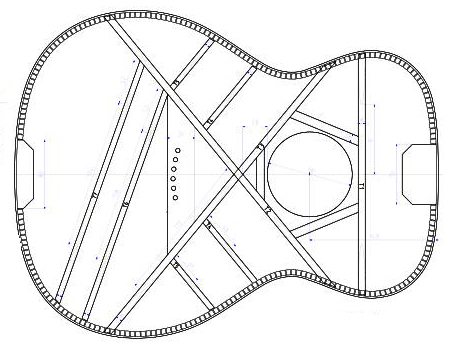 There are different bracing techniques for different types and styles of guitar, but the X-Bracing pattern devised by C. F. Martin in the 1940’s is standard on nearly all steel strung acoustics, particularly dreadnought shapes. What about the bracing’s on our Carolan guitar, have we followed convention? Well … not quite. We have on the back panel, as Nick is using the ladder bracing pattern, typical for this type of application. But on the soundboard, a different approach was needed. 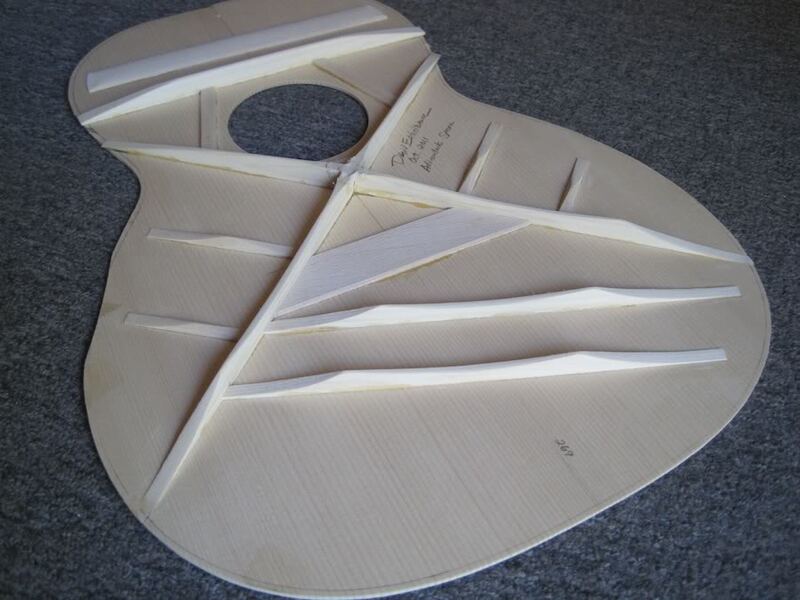 During the design phase of Carolan we were keen to explore the placement of multiple aestheticodes on the front of the guitar, as it will be the most publically viewed surface. Although, when we say ‘we were keen’, there was a lone voice in the room who repeatedly murmured phrases such as “no”, “much less” and “not below the bridge”. Needless to say that voice belonged to our luthier, Nick, who was trying to restrain us from extensive engraving and inlaying on the guitar’s soundboard. We eventually talked Nick round (wore him down) and we pursued the elaborate inlay design on the soundboard as seen in Post 17: The Big Etch. However, this left Nick with a challenge – how to maintain the structural integrity of the soundboard with so much wood engraved out of it? Nick addressed this in two ways. First, he added an additional X-Bracing in the lower bout of the guitar, to support the area that had been engraved below the bridge – very unusual to inlay in this area of the guitar as it is a key resonant surface. Second, Nick used thicker struts to reinforce the soundboard all-round. This has pushed Nick into new territory – so, what will it sound like? Nick’s not sure and we certainly don’t know! 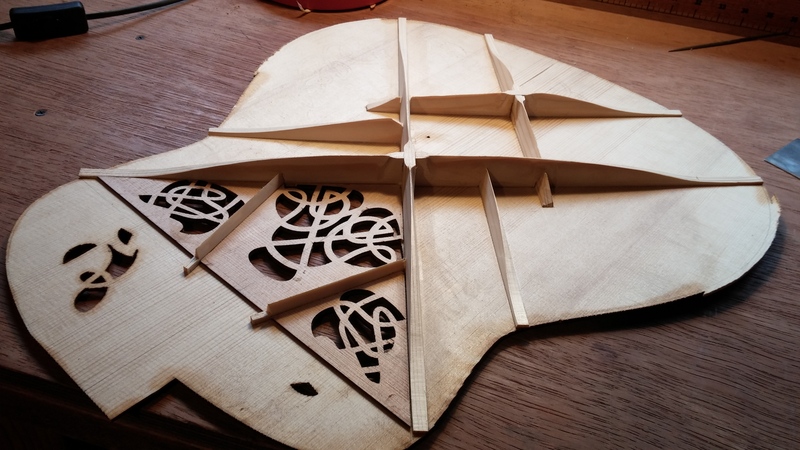 Carolan’s soundboard bracing pattern. Note the thick struts and extra X-Bracing at the bottom. Also, note the panels placed around the elaborate sound hole codes to reinforce them. This exploration into uncharted waters has been a fascinating part of Carolan’s journey to date. The integration (or would collision be a better word?) of aestheticodes into the tried, tested and established practice of crafting an instrument has presented a number of unique challenges for our luthier. 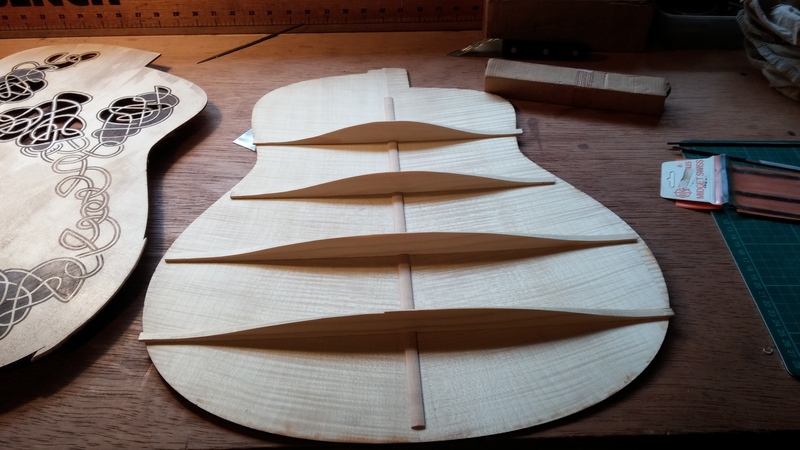 Bracing stuff – and pretty much any pun you can think of about bracing – as we head inside the Carolan guitar to take a look at how our design has challenged tradition.